1864. 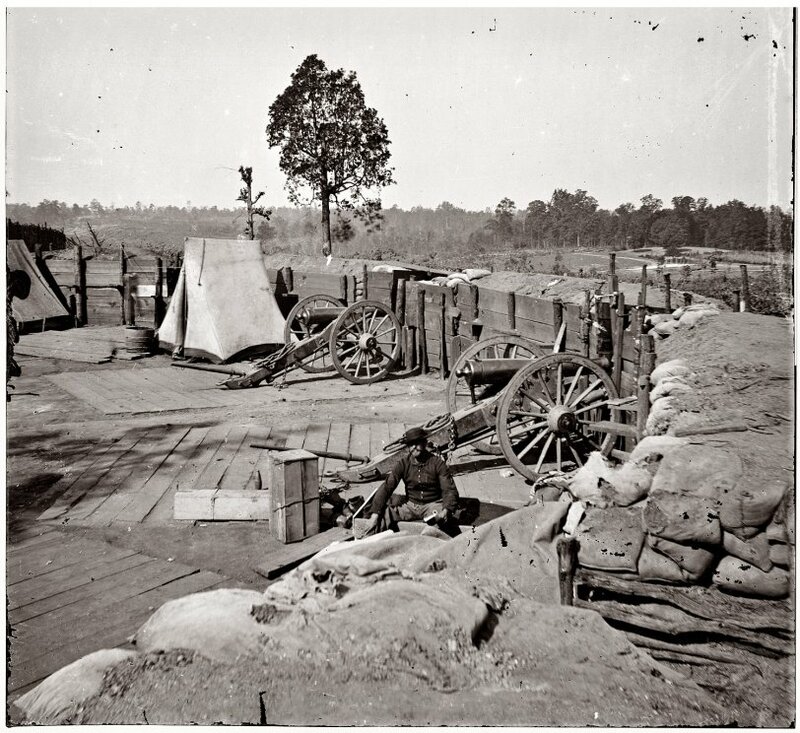 Union Army soldier at Confederate fortifications outside of Atlanta. Wet collodion glass-plate negative by George N. Barnard. View full size. Submitted by Denny on Thu, 11/22/2007 - 9:38pm. Earliest born person photographed? Although Daguerre is generally considedred the first to have taken a photograph of a person (see his capture of someone getting their shoes shined), I'll suggest that William Henry Fox Talbot took the first photo of someone clearly recognizable. His 1840 photograph of a coachman may stand as the oldest known photo of a person, and the oldest person (?) photographed. Submitted by scribe9999 on Thu, 11/22/2007 - 8:03pm. Perhaps it was the play "Our American Cousin" by Tom Taylor. Submitted by Denny on Thu, 11/22/2007 - 7:32pm. Probably a Sidney Sheldon novel he picked up at the gift shot in the Atlanta airport during a six-hour flight delay. Just a guess. Submitted by Anonymous Tipster on Thu, 11/22/2007 - 3:37pm. Wonder what the book was he was reading. Submitted by Anonymous Tipster on Thu, 11/22/2007 - 12:04pm. 1864? Wow. That's 143 years! Submitted by Anonymous Tipster on Thu, 11/22/2007 - 6:30am. 1864? Wow. That's 143 years! And that photo as good as those from my 3 MP digital camera!